Play It Forward is making its way back to Causeway Point for its last-ever stop and it’s going to be a week’s worth of colourful fun this Christmas and School Holidays! In the last edition of Play It Forward, Frasers Centrepoint Mall’s giant ball pool charity event will be held between 11am to 9pm daily from 5 to 11 December at Causeway Point’s main atrium (Level 1). So donate a minimum of $5 to get 15 minutes of free play in the ball pool. If you're signing up for a slot, we would like to remind you that the first session starts at 11.00am (registration starts at 10.40am), while the last play session is 8.40pm. This roving charity ball pool has been to Causeway Point, Northpoint, YewTee Point, Waterway Point and Eastpoint Mall, with more than 9,500 happy participants so far. So get those socks** on and play it forward for the last time at Causeway Point! **Participants must wear a pair of socks before entering the ball pool. You can bring your own or buy a new pair onsite for only $1. To mark the last stop of the year-long Play It Forward event, we will also be presenting the final donation cheque to Community Chest on 9 December 2016. Stop by and find out just how much donations all our fabulous participants have contributed so far! Remember, this is the last chance for you to do your part for families in your community and play it forward! For more details on the beneficiaries, please read on. With a minimum donation of $5 you can enjoy 15 minutes of free play in the ball pool. In return, Frasers Centrepoint Malls will match your donations dollar-for-dollar up to $30,000! Planned as a year-long initiative by Frasers Centrepoint Malls, in partnership with Community Chest, the ball pool is aimed at raising funds for Family Services Centres (FSCs). FSCs serve as community-based family resources, providing much needed support for families that are facing difficulties. 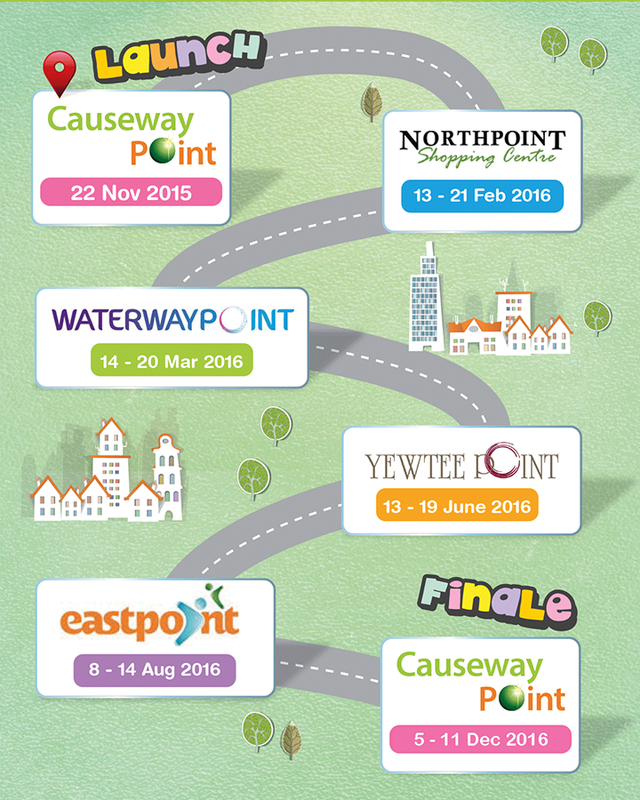 Join our Ball Hunt & WIN a $5 Causeway Point Gift Card! If you find a ball in the ball pool with the Causeway Point logo, make a grab for it! You can exchange the ball for a $5 Causeway Point Gift Card*! *Redemption of $5 Causeway Point Gift Card is limited to one redemption per shopper per day. Click here for more event images. The Event is open to residents of Singapore. All participants in the Event (each, a “Participant”) must complete and sign one Indemnity & Waiver form each. For participants who are minors (i.e. below the age of 18), the form must be signed by a parent or legal guardian. The event will be conducted from 5 December 2016 to 11 December 2016. A total of 100 balls with the Causeway Point logo are to be found within the ball pool. Participants who find a ball with the Causeway Point logo within the allocated play time will receive a $5 Causeway Point Gift Card. Each participant is allowed to receive only 1x $5 Causeway Point Gift Card per session even if he or she presents more than 1 ball at the play session. Acknowledgement of prize collection by a minor must be done by a parent or legal guardian. Acceptance of a prize constitutes unconditional consent to and grants Frasers Centrepoint Malls to use the winner’s name and/or likeness for social media, advertising, marketing, promotional and archival purposes without further notice or compensation, unless prohibited by law, by parents/guardian of participants. Employees of Frasers Centrepoint Malls, together with their participating business partners and advertising agencies, and their immediate family members, are not eligible to enter this contest. To the maximum extent permitted by applicable law, Frasers Centrepoint Malls reserves the right, in its sole discretion, to revise the rules of the contest, or revise or cancel the contest at any time, or to modify, terminate, or suspend the contest should unauthorized human intervention or other causes beyond Frasers Centrepoint Malls’ controls corrupt or impair the administration, security, fairness of the contest results. Frasers Centrepoint Malls is not responsible for any human or other error that may occur in the determination of the results, nor responsible for any error, omission, interruption, deletion, defect, delay in operation or transmission, theft or destruction or unauthorized access to, or alternation of results. In the event of any dispute, all decisions made by Frasers Centrepoint Malls will be final and no correspondence will be entertained. Other terms and conditions of the Causeway Point Gift Card apply. All participants will be required to sign an indemnity form before entering the ball pool. Changes in time slots (once registered) will not be permitted. Registration slots are available in 15-minute intervals, on a first-come-first-served basis. For safety reasons, only a maximum of 30 participants may enter the ball pool at any point of time. For health and safety reasons, participants who are feeling unwell will not be allowed to enter the ball pool. Food and drinks are not allowed inside the ball pool. All footwear, accessories, valuables and loose items including, but not restricted to handphones, cameras, jewellery and any electronic devices must be removed before entering the ball pool. Any valuables brought inside the ball pool will be at owner’s own discretion. Wearing socks is mandatory for all participants entering the ball pool. Participants may (1) bring their own pair of socks; or (2) purchase a brand new pair of socks onsite for $1. Children below 90cm height will require adult supervision (inside the ball pool), and will be counted as 2 registered participants with a minimum $10 donation. Parents/ guardians of children below 12 years of age are to be within the immediate vicinity of the ball pool to ensure the safety of the child if the parent/ guardian will not be inside the ball pool at the same time as the child. All participants or their guardians must ensure their own safety, and of others inside the ball pool. Frasers Centrepoint Malls and its agencies will not be responsible for any injury, loss or other complications arising from the use of the ball pool. Safety marshals will be on hand to maintain order and safety, and reserve the right to stop any participants who engage in reckless, dangerous, or abusive behaviour, including ordering any participant to exit the ball pool at any point in time without recompense. All donations made to Community Chest through this programme are not entitled to tax exempt status. Donations are not refundable at the point of registration or under any circumstances, including the unlikely event of any emergency where evacuation is required before or during play in the ball pool. Frasers Centrepoint Malls will not be under any obligation to compensate participants for their donations. Play it Forward, for marketing, promotion and/or advertisement purposes, including print, audio-visual and social media, without restriction or limitation and for an unlimited number of times.